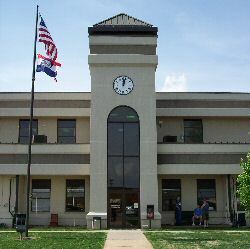 Taney County is located in the southwest corner of Missouri and is in the heart of Ozark Mountain Country. Land area: 632.4 sq. mi. Taney County was organized on January 4, 1837. The name Taney County arrived from Roger B. Taney, Chief Justice of the United States Supreme Court. The first Courthouse was built by the early pioneers in 1837 and destroyed on July 22, 1861 during a Civil War Battle. The second Courthouse was destroyed by fire on December 19, 1885. The third Courthouse was removed in 1952 to permit the building of Bull Shoals Lake. The fourth, and present, Courthouse was occupied on August 1, 1952. In 1989, an addition was started and completed in 1991. In November 2004, Taney County went on-line with its GIS system and made internet mapping available to the general public. Taney County now offers the ability to search Assessor records for ownership, valuation, and other parcel information. Cities in Taney County, MO: Branson, Hollister, Forsyth, Bradleyville, Kissee Mills, Protem, Rueter, Point Lookout, Ridgedale, Taneyville, Cedarcreek, Kirbyville, Powersite, Rockaway Beach, Walnut Shade.